In the F&W Test Kitchen, we recycle a lot of ingredients that people might normally discard. For instance, instead of composting potato skins we bake them until crisp and browned. Here, 3 superdelicious ways to fill these flavorful boats. To minimize waste in the Food & Wine Test Kitchen, we recycle a lot of ingredients that people might normally discard. For instance, when making a batch of gnocchi today, the potatoes were cooked and the insides scooped out, leaving behind perfectly useful little boats. Instead of composting this leftover part of the potato, we decided to drizzle them with olive oil, season with salt and pepper and bake in a 400° oven on a baking sheet for about 20 minutes. Here, three awesome ways to fill these crispy, flavorful potato boats. 1. 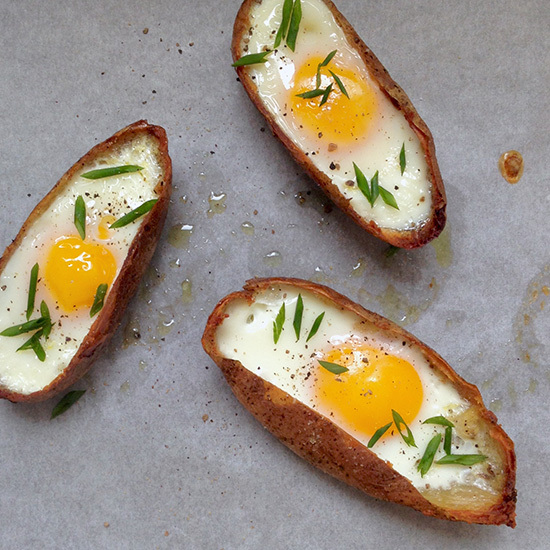 Crack one large egg into each crispy potato skin. Bake until the whites are set and the yolks are runny. Garnish with chives and serve. 2. Layer tomato sauce, pepperoni and cheese (or any of your other favorite pizza toppings) and bake just until the cheese is melted. Serve these handheld pizzas with extra tomato sauce for dipping. 3. Spoon in some of your favorite chili and top with shredded cheddar cheese. Bake just until the cheese is melted. Garnish these mini-chili bowls with sour cream and scallions.